There are so many types of mead which have been developed in time, that today, mead can satisfy all tastes. – sweetness: mead can be from bone dry to extremely sweet. – to the expression of the adjuncts (the fruits, spices, and/or grains) can range from very low to fairly high. Basic Mead – made only of honey, water and yeast (eventually with a small amount of acid, either natural or artificial, to balance the sweetness. Bochet – in this mead, honey is caramelized or burned separately before added the water. People have claimed it smells like burned marshmallows or caramel. Great mead – a mead aged for several years. As opposed to ‘short’ mead. 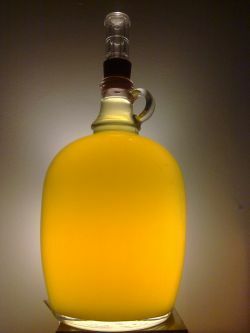 Melomel – a mead made with fruit or fruit juices, or both. optional there might also be spices added. Cyser – a mead made with apples. Also known as cider. Metheglin– a mead made with added spices like: ginger, tea,orange peel, nutmeg, coriander, cinnamon, cloves or vanilla. Pyment – a mead made with grapes or grape juice. Sack – that’s the name of a stronger mead, usually sweet, made with more honey than is typically used. The finished product contains a higher-than-average ethanol concentration (meads at or above 14% ABV are generally considered to be of sack strength). It often retains a high specific gravity and elevated levels of sweetness, although dry sack meads, with no residual sweetness, can also be produced. According to one theory, the name derives from the fortified dessert wine, sherry, that was once called “sack” in England. Another theory is that the term is a phonetic reduction of “sake” the name of the well-known Japanese beverage. Short mead or quick mead – a mead that is brewed really fast, from 3 days to a month. Because of the techniques used in its fast reaction, short mead shares some qualities found in cider (or even light ale): primarily that it is effervescent, and often has a cidery taste. It can also be champagne-like. Traditional mead. That’s the type of mad made without any chemicals. Only natural ingredients. Acerglyn: A mead made with honey and maple syrup. Black mead: A name sometimes given to the blend of honey and black currants. 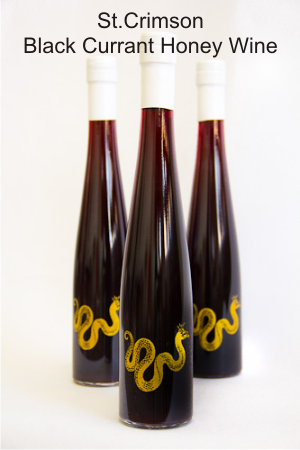 Bochetomel: A Bochet style mead that also contains fruit such as elderberries, black raspberries and blackberries. Braggot: Also called bracket or brackett. Originally brewed with honey and hops, later with honey and malt—with or without hops added. It has an welsh origin. Capsicumel: A mead flavored with chile peppers. Chouchenn: A kind of mead made in Brittany. Czwórniak : A Polish mead, made using three units of water for each unit of honey. Dandaghare: A mead from Nepal, combines honey with Himalayan herbs and spices. It has been produced since 1972 in the city of Pokhara. Dwójniak: A Polish mead, made using equal amounts of water and honey. Gverc or Medovina: Croatian mead prepared in Samobor and many other places. The word “gverc” or “gvirc’ is from the German”Gewürze” and refers to various spices added to mead. Hydromel: Name derived from the Greek ὑδρόμελι hydromeli, i.e. literally “water-honey”. All Latin countries have a variation from this: French hydromel; Catalan hidromel andaiguamel; Galician aiguamel; Portuguese hidromel; Romanian: hidromel; Italian idromele and Spanish hidromiel and aguamiel. Medica: Slovenian, Croatian, variety of mead. Medovina: Czech, Croatian, Serbian, Montenegrin, Bulgarian, Bosnian and Slovak for mead. Commercially available in the Czech Republic, Slovakia and presumably other Central and Eastern-European countries. Medovukha: Eastern Slavic variant (honey-based fermented drink). Midus: Lithuanian for mead, made of natural bee honey and berry juice. Infused with carnation blossoms, acorns, poplar buds, juniper berries and other herbs, it is often made as a mead distillate or mead nectar, some of the varieties having as much as 75% of alcohol. Mõdu: An Estonian traditional fermented drink, with a taste of honey and a low alcohol content of 4.0%. Morat: Morat blends honey and mulberries. Mulsum: Mulsum is not a true mead, but unfermented honey blended with a high-alcohol wine. aged mead: a mixture of honey and water and/or berry juices, brewed very slowly, like in 12 to 50 years. It is anaerobic fermentation in airtight vessels, in a process similar to the traditional balsamic vinegar, creating a rich, complex and high-priced product. drinking mead: a kind of honey wine made from diluted honey by traditional fermentation. boiled mead: a drink closer to beer, brewed from boiled wort of diluted honey and herbs, very similar to modern medovukha. Omphacomel: A mead recipe that blends honey with verjuice. Oxymel: Another historical mead recipe, blending honey with wine vinegar. Pitarrilla: Mayan drink made from a fermented mixture of wild honey, balché-tree bark and fresh water. Półtorak: A Polish great mead, made using two units of honey for each unit of water. Rhodomel: Rhodomel is made from honey, rose hips, rose petals or rose attar, and water. Show mead: Aka “plain” mead. it has honey and water as a base, with no fruits, spices or extra flavorings, but with a special yeast nutrient and other enzymes to produce an acceptable finished product. Sima: a quick-fermented low-alcoholic Finnish variety, seasoned with lemon and associated with the festival of vappu. Tej/Mes: Tej/Mes is an Ethiopian and Eritrean mead, fermented with wild yeasts and the addition of gesho. Tella/Suwa: Tella is an Ethiopian and Eritrean style of beer; but with the inclusion of honey some recipes are similar to braggot. Trójniak: A Polish mead, made using two units of water for each unit of honey. White mead: A mead that is colored white with herbs, fruit or, sometimes, egg whites. What should a wine drinker start with? For a wine drinker, mead can be weird, because of its broad range of characteristics. A wine drinker should start with pyment made with their favorite wine varietal. – A chardonnay drinker should try dry tupelo blossom honey and chardonnay pyment. – A red wine drinker should try something like a sangiovese pyment. – An ice wine drinker should try a sweet white wine grape based pyment. – A champagne drinker should try a sparkling mead made from orange blossom honey, it will have the floral character of a citrus orchard in bloom. – A fruity red wine drinker can choose a red mead. Lots of red meads are made from berries. Yet Americans are not very familiar with them. Alternatives to fruity reds would include various melomels. Black currants are a wonderful fruit Americans rarely encounter, they are somewhat earthy, musty and acidic. Red currants are softer in character than the blacks but still make a very nice mead. In German-speaking areas, syrup or nectar derived from the red currant is added to soda water and enjoyed as a refreshing drink named Johannisbeerschorle. In Mexico, redcurrants are a popular flavor for iced/frappé drinks and desserts, most commonly in ‘raspado’ (scraped ice) form. Elderberries are another fruit most Americans are not familiar with though they grow wild over much of North America. Elderberries are sometimes used commercially to impart a generic fruity character to foods and home winemakers sometimes add dried elderberries or even dried elderflowers to their wines. People throughout much of Central, Eastern, and Southeastern Europe use a similar method to make a syrup which is diluted with water and used as a drink. A soft drink variety called “Shokata” is made by Fanta producers, which is sold in 15 countries worldwide. In the United States, this French elderflower syrup is used to make elderflower marshmallows. St. Germain, a French liqueur, is made from elderflowers. Yet the berries are not to be consumed uncooked or not fully ripe, as they contain a toxin we’d better avoid. Mulberries are another unusual fruit, the leaves of mulberry tree are the food of the silk worms. The mulberries look something like a blackberry though the fruit is fairly low in acid and can have a slight citrus/grapefruit character. The ripe fruit is edible and is widely used in pies, tarts, wines, cordials and tea. yet, the unripe fruit and green parts of the plant have a white sap that may be toxic, stimulating, or mildly hallucinogenic. A combination of fruit or even fruits combined with some red wine grapes can results in a pleasant and complex beverage. Do you want a homemade mead recipe? Honey Vinegar- What is honey vinegar and what is it good for?